Saint Helena, Calif. – The third annual CLIF CampoVelo will take place April 26-28, 2019 in Napa Valley, combining world class cycling, wellness, cuisine, libations, and fundraising into a unique three-day event in the heart of America’s preeminent wine growing region. Organizers are pleased to announce the return of title sponsor Clif Bar & Company and former professional cyclist and chef Chris Cosentino is back with fellow cyclists, chefs, winemakers, and brewmasters with a winning recipe for a wellness weekend like no other. By blending the best of the culinary world with cycling, hiking and yoga, CampoVelo, produced by Ride Napa Valley, has become an annual highlight in the Napa Valley. Over the course of the weekend, more than 20 featured guests (chefs, winemakers, pro-cyclists, and other notables), including Team CLIF Bar Cycling, will lead attendees in a myriad of activities designed to support and promote CampoVelo’s deserving beneficiaries. Each morning, featured guests will accompany the participants on hikes, in yoga sessions, and on mountain, road, and e-bike rides throughout Napa Valley. After hours of exploring the great outdoors on two-wheels or two-feet, Cosentino and friends will lead product demos, workshops, and prepare five-star meals for attendees. New to the event this year is Miyoko’s Kitchen. Founder Miyoko Schinner is the tenacious, award-winning vegan celebrity chef behind Miyoko’s. Her passion for her craft and mission is unrivaled, and the publication of her groundbreaking book, Artisan Vegan Cheese, kicked off the start of the vegan cheese revolution. Miyoko will be participating all weekend, including a special wine and cheese pairing at Clif Family Winery on Friday, creating doing a vegan course for Friday’s VIP dinner, as well as participating in Saturday’s culinary demos. The weekend begins in St. Helena on Friday, April 26th with a selection of road and mountain bike rides followed by lunch at Clif Family Winery’s tasting room. Opening day continues with wine & beer experiences featuring Clif Family Winery and Mad Fritz Brewing Company, a poolside party at Calistoga Motor Lodge and Spa, and an evening Welcome Reception with bites by Cosentino, wine & beer tastings, and craft cocktails at Calistoga’s Tamber Bey Vineyards. A ticketed five-course dinner hosted by Cosentino, Matt Jennings, Bryan Voltaggio and more paired with acclaimed Napa Valley wines and beer at Tamber Bey Vineyards will benefit No Kid Hungry. Kick Saturday off with breakfast and a selection of rides and wellness activities throughout Napa Valley, followed by a Champion’s Lunch, culinary demos, and the CampoVelo Marketplace featuring an artisan assortment of food, drink, and wares to taste, test or buy. One of the weekend highlights, the culinary demos offer something for everyone, and include a session for the “Vegan Athlete” with Miyoko Schinner CEO and Founder of Miyoko’s Kitchen with seven-time USA Cycling National Champion Dotsie Bausch, the “Perfect Pantry” featuring Top Chef Masters winner Bryan Voltaggio with pro-cyclistJanel Holcomb for a how-to session on making your pantry your greatest culinary asset, and a session on “Salt, Sugar and Carb Loading” with chefs Christian Pappanicholas with renowned cyclists Adam Pulford & Lauren Hall. Rounding out the Saturday demonstrations are “Seeds Matter” with Clif Family Chef John McConnell’s take on what heirloom means for our food and why it’s important to protect these breeds, and culminating with CampoVelo host and Top Chef Master winner Chris Cosentino with pro-cyclists Yuri Hauswald, Tina Brubaker & Carl Decker who will “Embrace Spring” and dress up a classic Spring ingredient with a simple, elegant twist. Following the demos on Saturday evening is the return of the wildly popular (and often hilarious) “Saturday Night at the Speedway”, a weekend highlight with epic bike relay races, featuring live music by The Mattson 2 and Hector, along with wine, beer, and food trucks at the Calistoga Speedway. The weekend culminates in a BIG way at Napa Valley’s oldest winery Charles Krug Winery. Sunday starts with a BIG Breakfast followed by the BIG Ride, gran fondo style with three route options (35/50/80 miles), or a hike at Bothe State Park. The ultimate post-ride finale is the CampoVelo BIG Feast at the iconic winery with a menu curated by Cosentino and his chef friends, Charles Krug wines and Mad Fritz beers, play lawn games, enjoy live music, relax, and bid on must-have silent auction lots. Individual event passes range from $35 for the Saturday Night Speedway to $675 ($755 after April 6) for the all-inclusive 3-day pass. Single day passes and four and eight member team passes are also available. All passes can be purchased at www.campovelo.com/register. 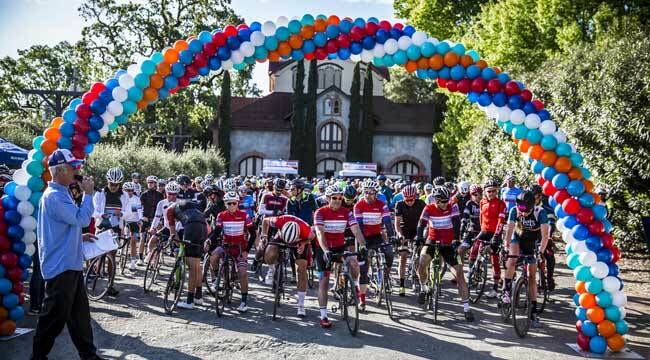 With the mantra “do good, one pedal stroke at a time,” CampoVelo benefits the Napa Valley Vine Trail Coalition and Chefs Cycle for No Kid Hungry. In addition to Clif Bar & Company and Miyoko’s Kitchen, other partners include Mercedes Benz of Fairfield, Colavita, Bialetti, Giant Bicycles, Clif Family Winery, First Republic Bank, Liv Cycling, Trek Travel, Kollar Chocolates, Mad Fritz, CAPO Cycling, WD-40, Chef’s Warehouse, Whitehall Lane Winery, Kara’s Cupcakes, Galanter & Jones, SRAM and Grove 45 EVOO.